QUICKER, SAFER, MORE ACCURATE & ECONOMICAL THAN AN ABRASIVE SAW! 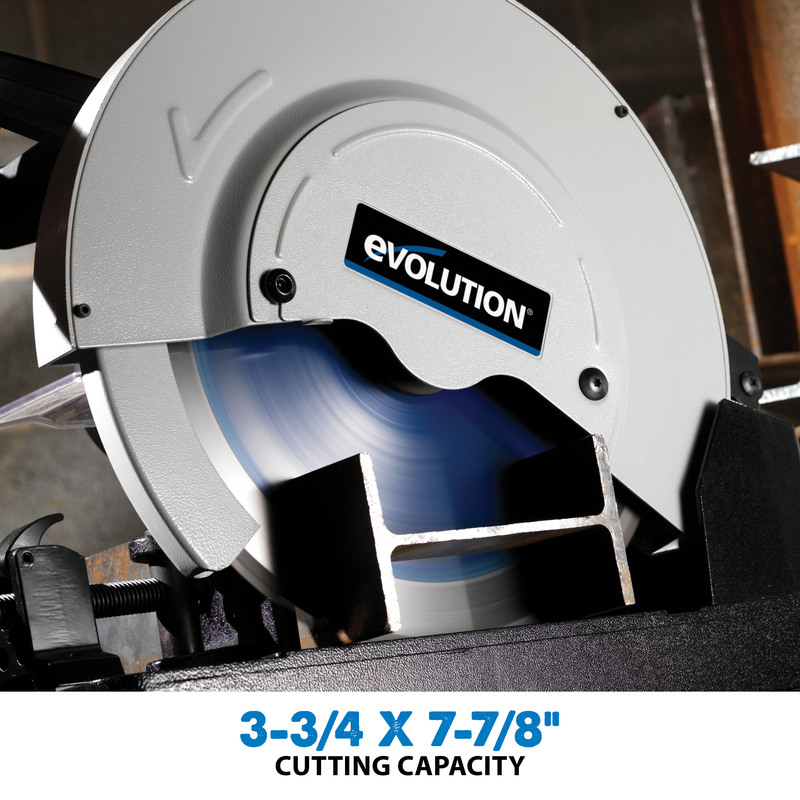 The incredible EVOSAW380 chop saw slices through mild steel with ease. No heat and virtually no sparks, producing a smooth, burr free, instantly workable finish. 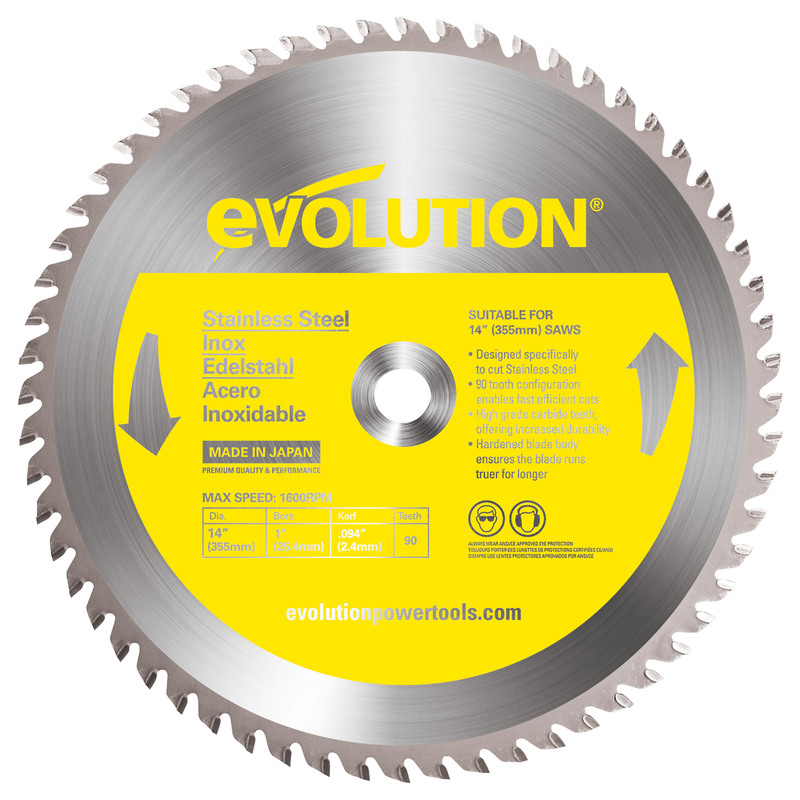 Unlike abrasive chop saws, the EVOSAW380 is the cleanest, fastest and most affordable way of cutting steel. Utilizing a powerful 15A motor and hi-torque gearbox, enabling the EVOSAW380 to handle even the most demanding on-site jobs. 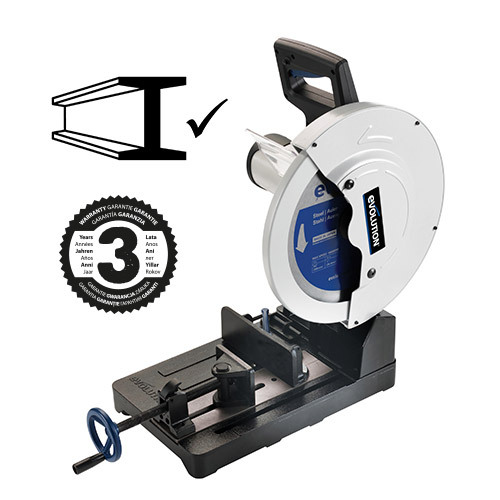 Ideal for cutting steel plate, square tube, angle iron, pipe, tube and metal roofing. 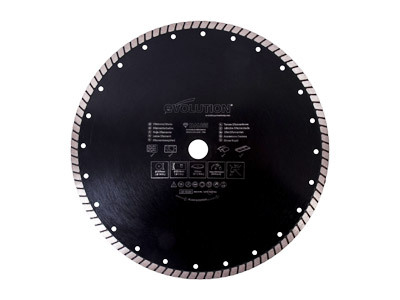 Optional 15” mild steel blade & 14” speciality blades are available for cutting thin steel, stainless steel, aluminum, wood & masonry. See below in related items for more info. **Evolution internal test data conducted on mild steel 50mm (2”) square tube - 6mm (1/4”) wall cut in 'diamond' position. 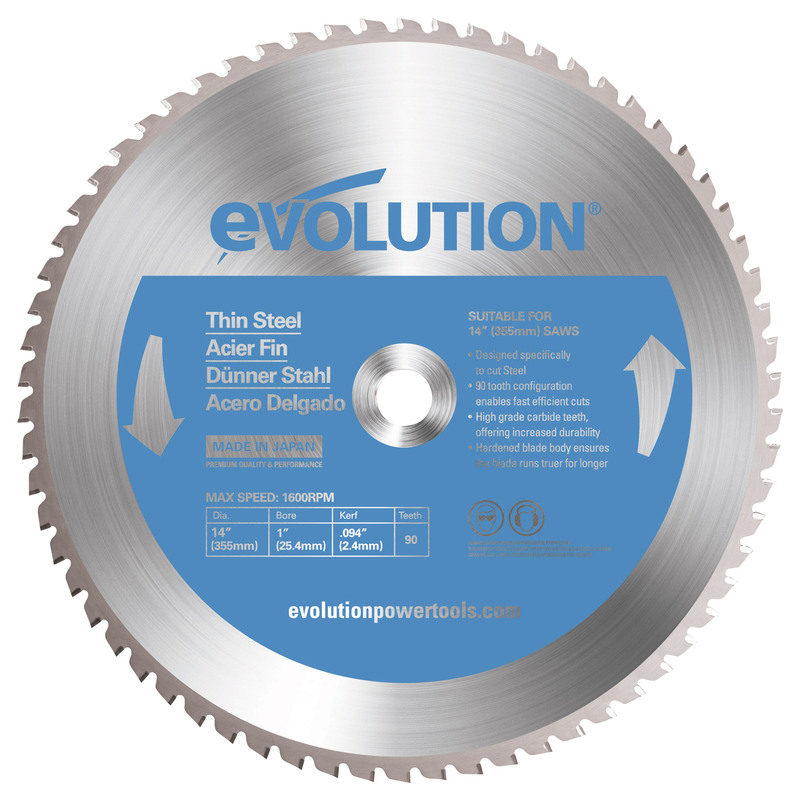 ◊Supplied with a 14” Evolution Mild Steel blade. 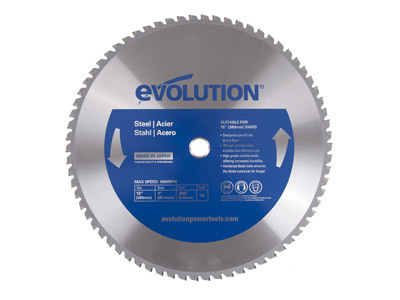 To achieve maximum capacities stated, fit with a 15” Evolution Mild Steel Blade. 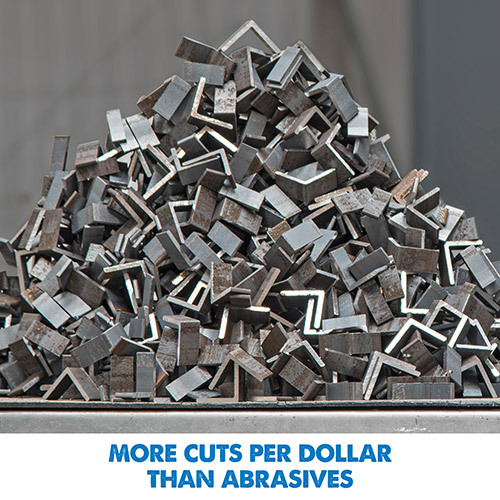 Quicker, safer, more accurate & economical than an abrasive saw! 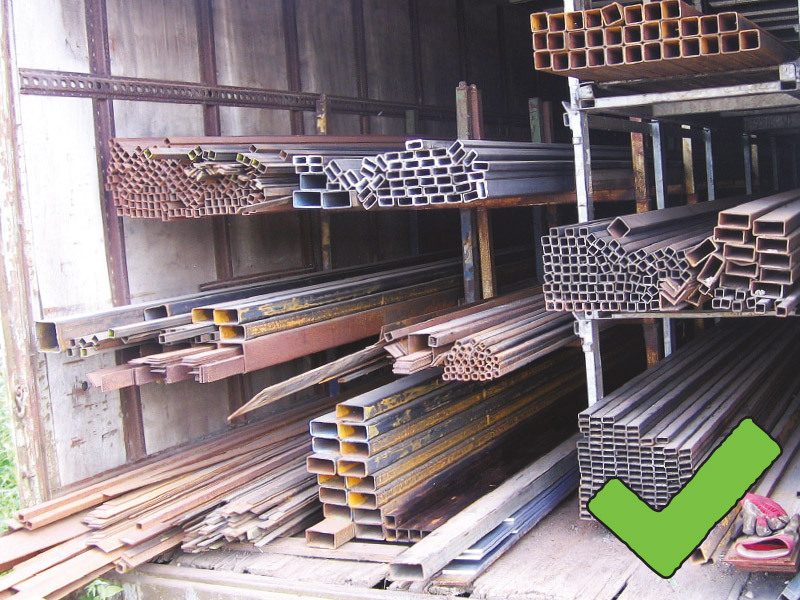 When cutting steel, the material has a workable finish. 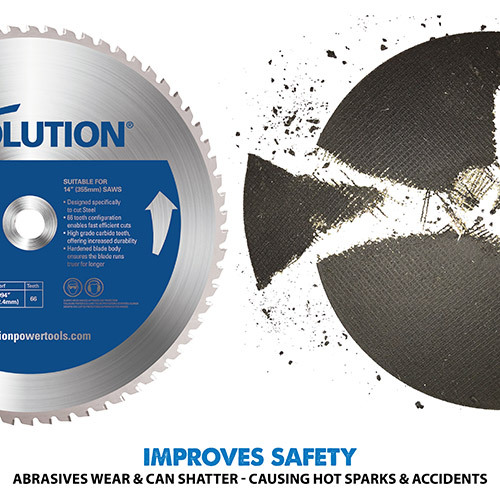 Virtually no heat, burrs or sparks are created, unlike inherently dangerous abrasive saws (shown above). 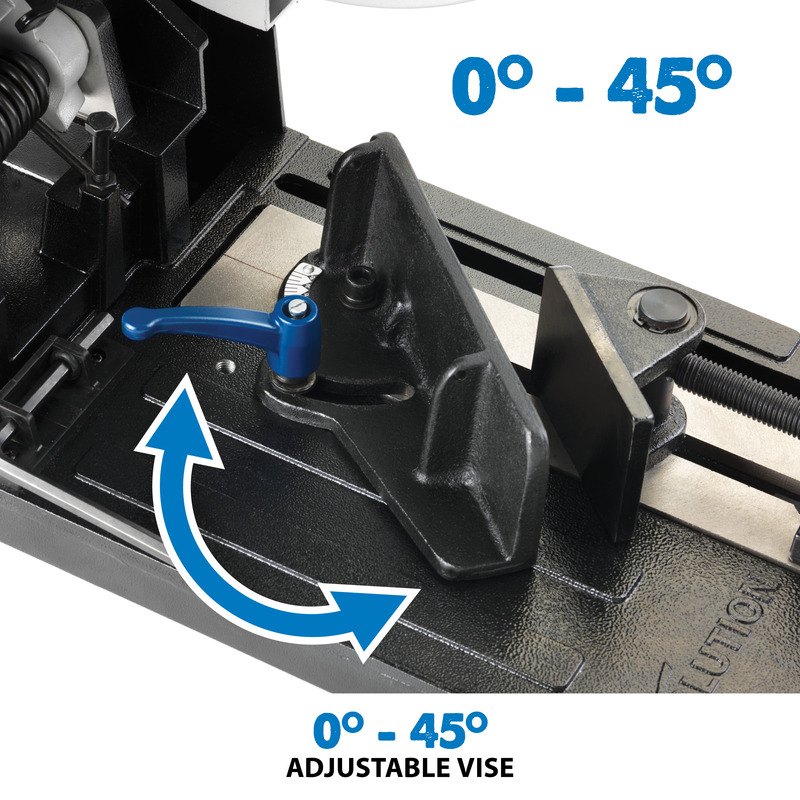 Fast action swivel vise enables cuts to be made from 0-45º. Hi-torque gearbox reduces motor load and improves performance. A pull-out collection tray makes it easy to dispose of metal chips. *Evolution’s internal test conducted on mild steel 50mm (2”) square tube - 6mm (1/4”) wall cut in ‘diamond’ position. Mild Steel Plate - Max. Thickness 1/4" 1/4"
Mild Steel Box Section - Max. 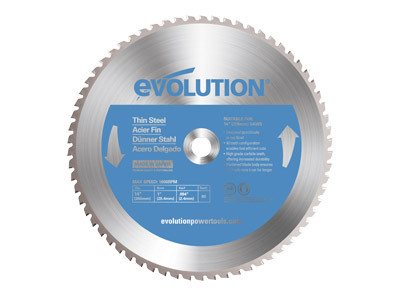 Wall Thickness 1/8" 1/8"
Minimum Cut Off Piece Length 1/2" 1/2"
What are the main differences between the Evolution Steel and Evolution Build machines? 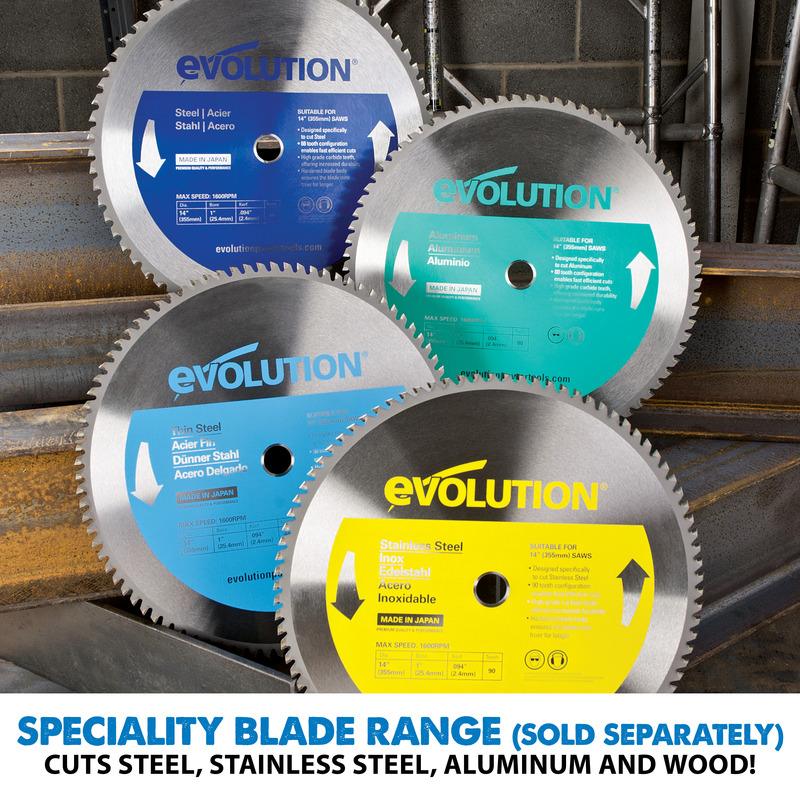 Evolution's blue range power tools are designed for commercial and industrial steel use and are suitable for cutting thicker Steels, Stainless Steels, Thin Steels, Aluminiums and Wood with the optional blades available. 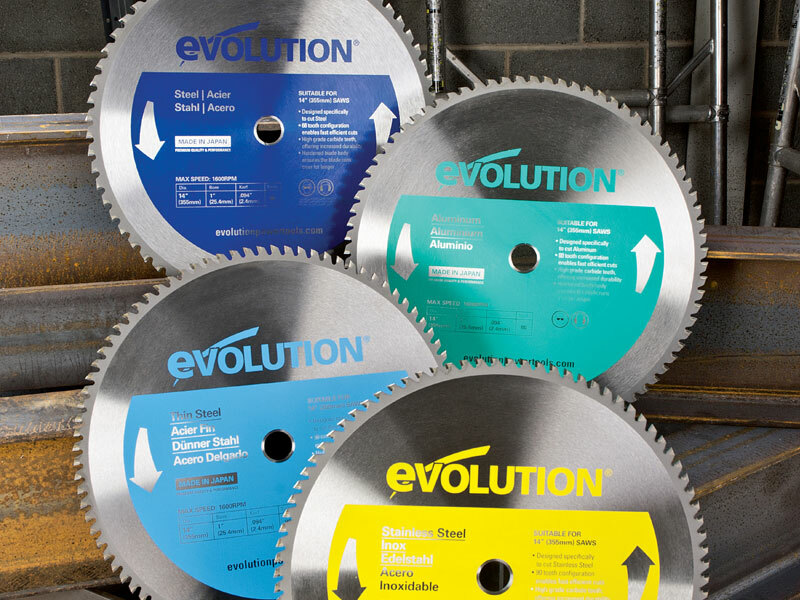 The combination of an Evolution Steel saw and blade is the premium performance in metal cutting technology. 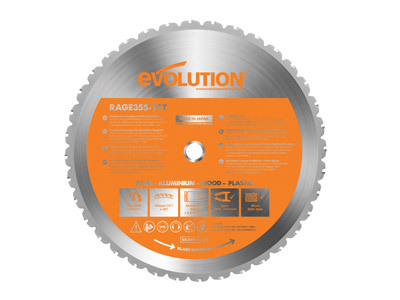 Evolution's orange range power tools are optimised for professional trade construction. They are well specified machines with a wide range of operational features and are designed and engineered for sustained and regular use. 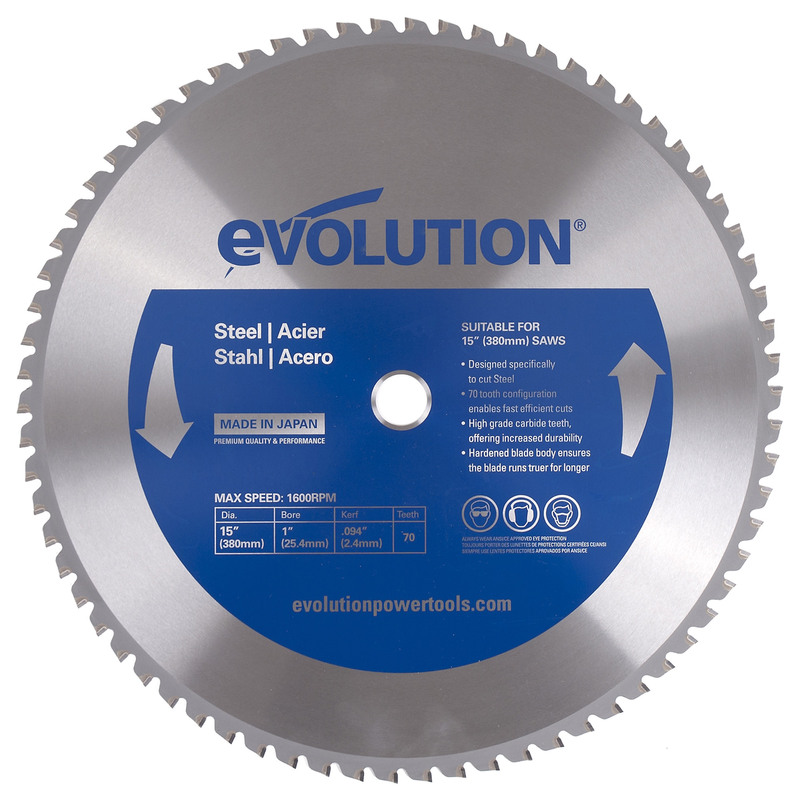 What is the difference between the EVOSAW355 and RAGE2 which also cuts steel? 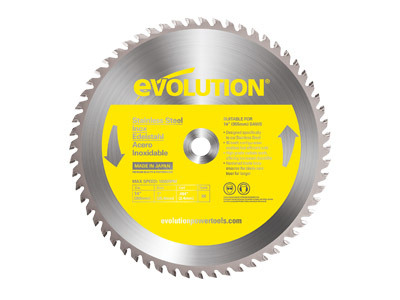 Evolution Steel’s EVOSAW355 base is made out of a heavy aluminium cast iron compared to the Evolution Build RAGE2 Multipurpose Saw which is made out of stamped metal. The clamps on the EVOSAW355 are also made thicker for better durability and it’s supplied with an increased toothed steel specific blade. Essentially, the EVOSAW355 is designed for commercial and industrial use whereas the RAGE2 Multipurpose Saw is made for commercial construction work and DIY projects. These differences are reflected in the retail prices. 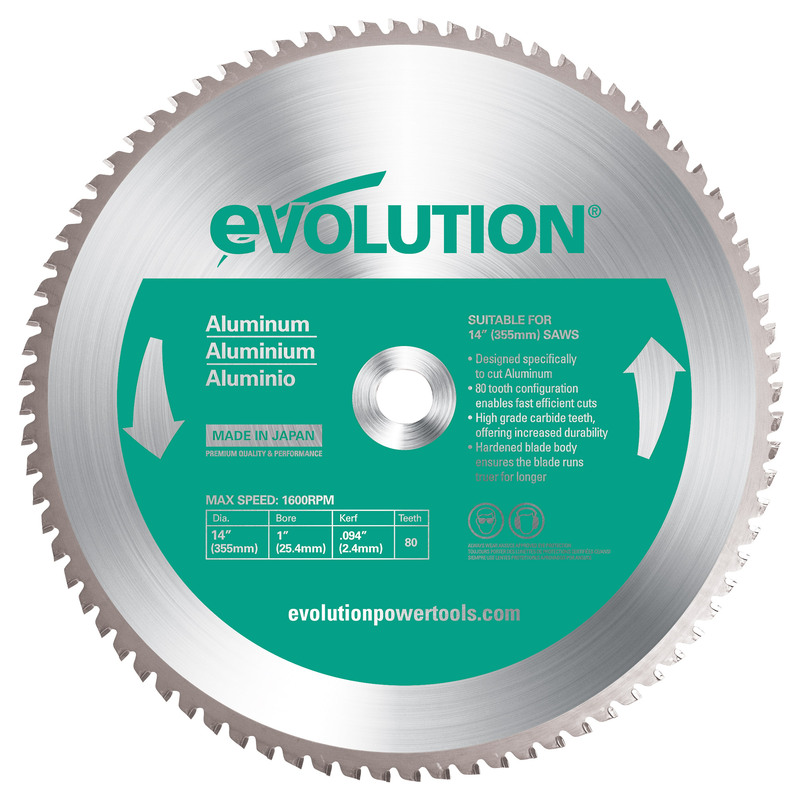 When fitted with an Evolution Speciality Carbide-tipped blade this machine can be used to cut: Steel, Stainless Steel, Aluminium and Wood. • Steel & Thin Steel: Material applications include square tube, angle iron, mild steel plate, pipe, tube and other ferrous metals. • Stainless Steel: Material applications include square tube, angle iron, stainless steel plate, diamond plate, pipe and tube. • Aluminium and other non-ferrous metals: Material applications include grating, extrusions, pipe and tube. 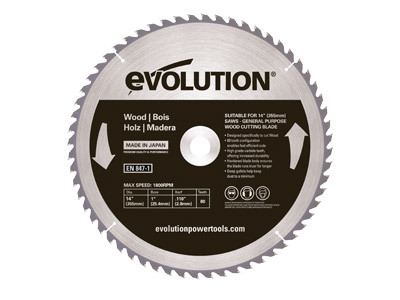 • Wood: The high-grade carbide tooth configuration enables fast efficient cutting and increased durability. Please read all safety warnings and instructions in the operator’s manual included with the machine. Yes, for dry cutting only. This machine will then cut stone, concrete & brick. How do I safely cut steel and prolong blade-life? 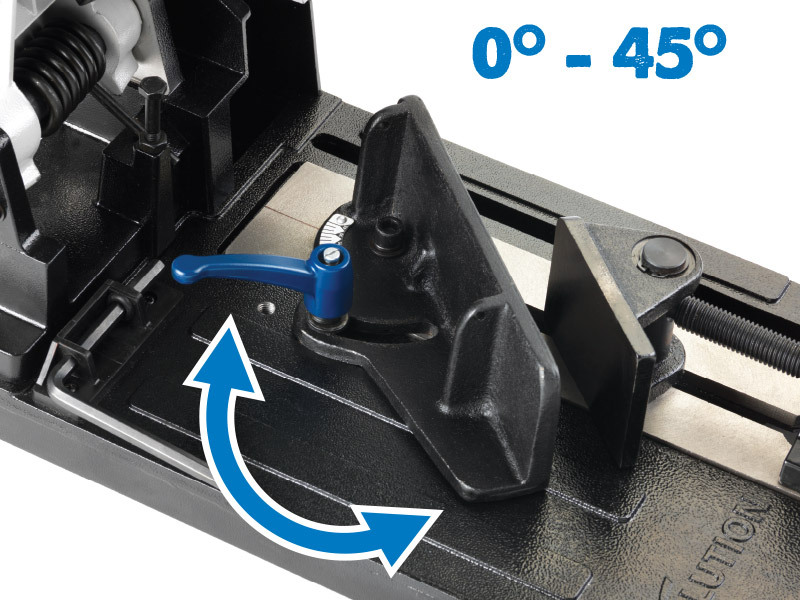 Please use the clamp securely as this prevents vibration which reduces blade-life. For more tips on prolonging blade-life, please watch this short video. What is the correct cutting technique? 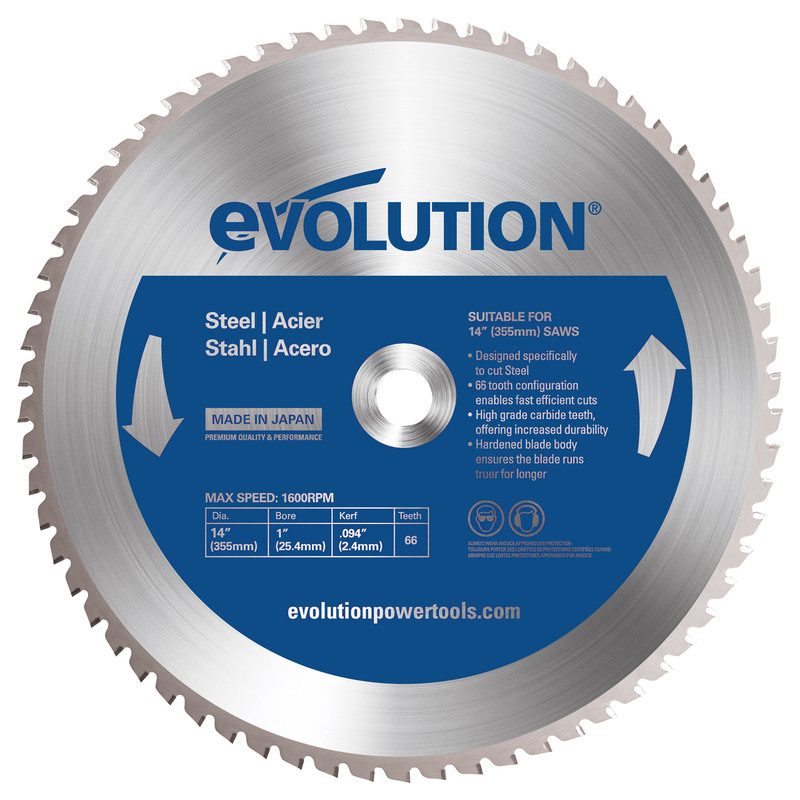 Don’t push down like a hot saw/abrasive wheel or fiber disc (which cut on speed/friction) as this will reduce blade-life and break/throw teeth. 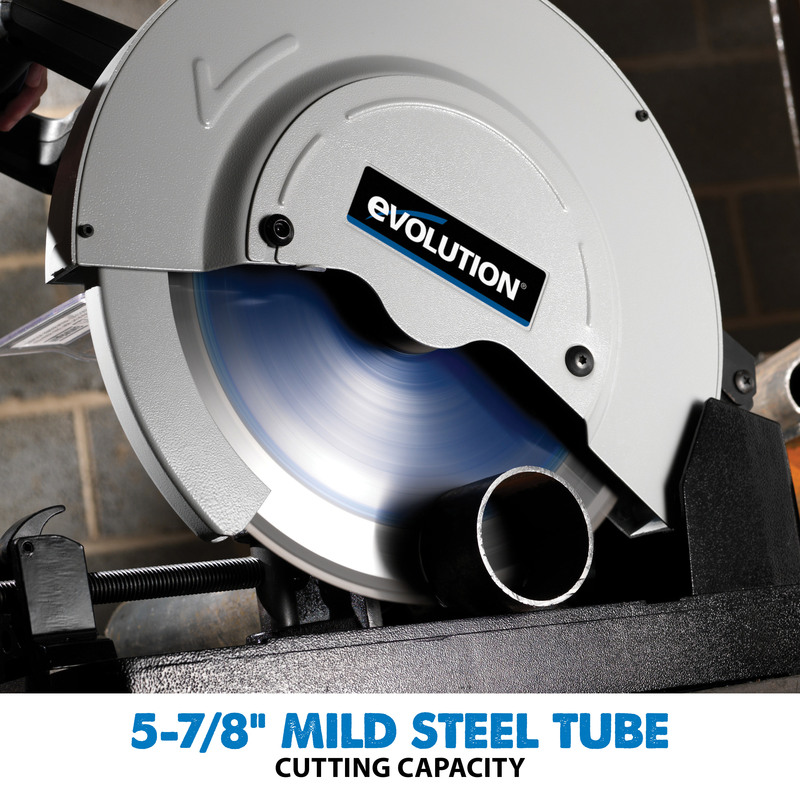 Evolution saws spin at a reduced optimum RPM with hi-torque. Carefully push down and let the blade do the work chipping at the material. The weight of your hand is all you need. Start up at full RPM and go all the way through and then back out the other side, at the max speed the blade runs true. Doing this each cut, you will have no issues when cutting mild steel. 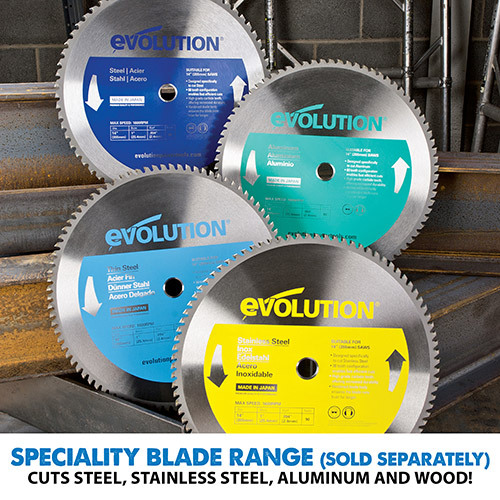 Use Evolution's specialty blades when cutting stainless steel, aluminum, thin steel or wood. 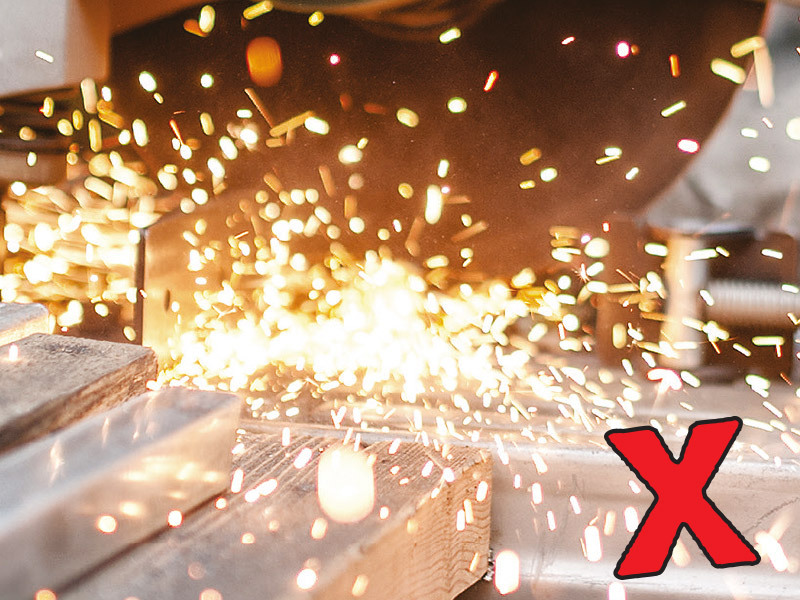 Are the images of the saw cutting steel without sparks real, or is it just camera trickery? We can assure you they are 100% authentic. 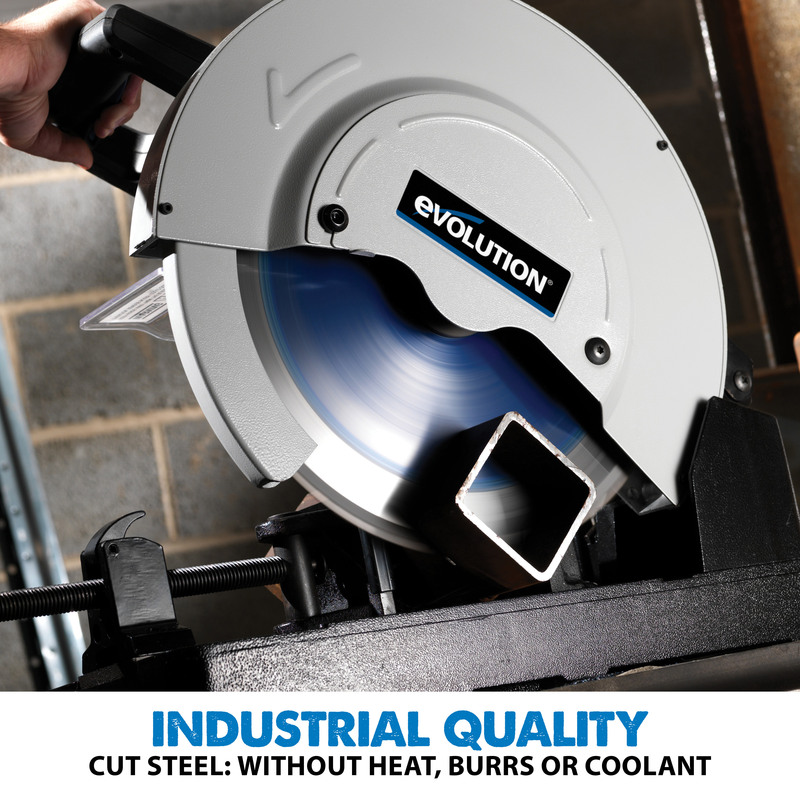 It really does hit home just how incredible the combination of an Evolution Steel saw and speciality blade is the ultimate in steel cutting technology when you see the fast, precise, burr-free cold-cuts without heat, sparks or grinding reworks required. How does the saw work? The saw is built with a rugged construction and has a hi-torque gearbox and blade system, which increases motor and blade-life. An optimum RPM speed ‘chips’ away at metals to reduce chatter and wear which provides a superior cut on any type of material. 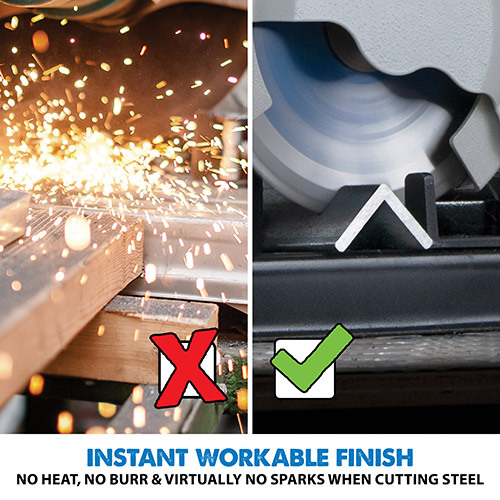 This displaces heat unlike abrasive cutting, leaving a clean-cut ready for you to weld. The serial number can be found on the motor housing of the machine. Where is the batch code for my machine? Yes, this is supplied fitted to the saw. Why is the arbor different? To deter people from fitting abrasive discs as the motor RPM is incorrect and this would be dangerous. 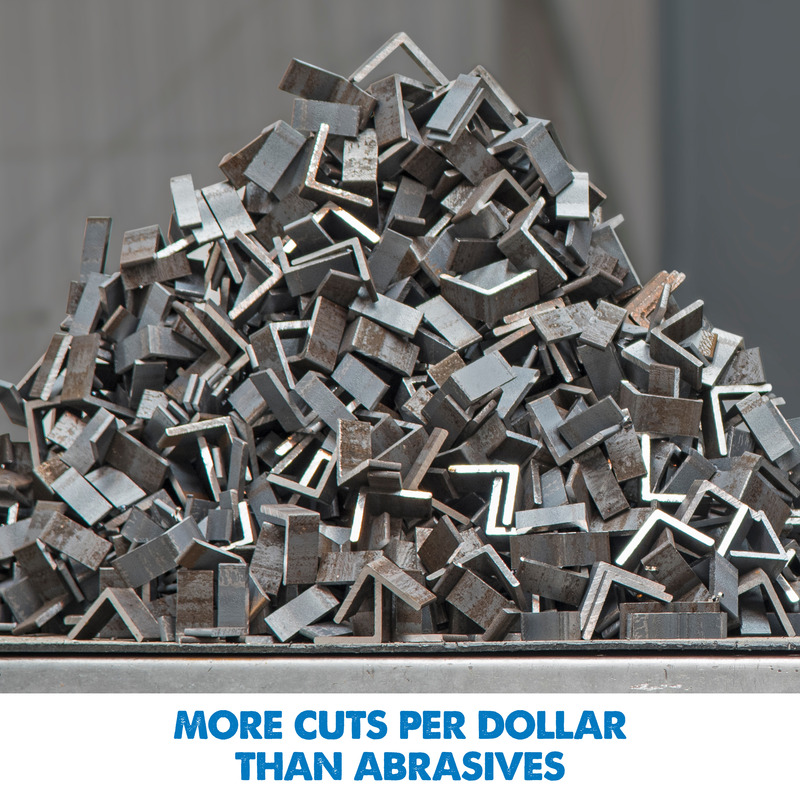 Can you fit an abrasive disc or vice versa? No, the motor RPM is incorrect for abrasive discs and it would be dangerous to attempt it. Also Evolution blades are not designed to run at the high RPM, so it would be beyond the safety specifications of the blade and dangerous to try Evolution blades on an abrasive cut-off saw likewise. A dust extraction cannot be fitted to this machine. Please use PPE. 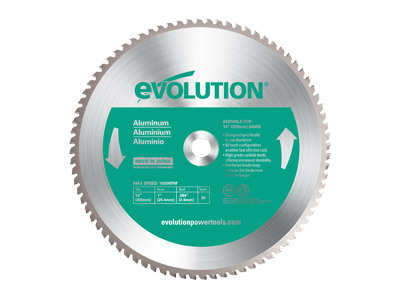 Information can be found at Evolution Warranty page. Not all locations may stock the product you need. Contact your local store before making your trip to ensure the product is available. Copyright © 2017. All Rights Reserved by Evolution Power Tools Ltd.